Your property and family needs a fence on which they can rely. Whether they’re keeping beloved pets safe from danger, or small children away from your swimming pool, fences need to be effective, and they need to last. Once you’ve installed a loop and spear fence, you don’t want to have to perform regular maintenance or replace it within just a few years. Everlast Services has been providing property owners with the perfect fencing solutions for over 20-years. 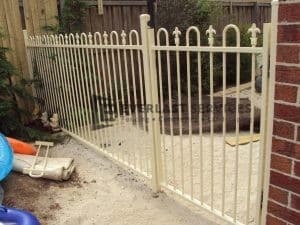 We know what works in Melbourne homes, and we know how to install a great fence while keeping costs down. We offer a full range of fencing options, from glass fencing, through to colorbond. All of our options are designed with one thing in mind – longevity. We also manufacture all of our steel products in-house, meaning we make huge savings on fabrication costs and include these savings on your quote. When you contract us for your fencing project, you’re making a decision to give back to the local community. We are 100% Australian owned and operated, and we always will be. We also source everything we can from local suppliers, because we believe that every dollar that ends up in our hands should be put right back into the local economy. Our community spirit also helps us to keep costs down. We purchase high-quality products at low-costs, and we ensure you see these savings. At Everlast, a quality loop and spear fence doesn’t have to cost an arm and a leg. Our experience allows us to guide you through your fencing options. We’ll provide you with the information you need to ensure you end up with a fence that suits your needs and your budget. We’ll never suggest anything you don’t need, so you end up with the perfect fencing solution. Does your property need more than a fence? If so, you’ve come to the right place. We offer the full suite of home improvement services, including landscaping, paving, decking and concreting. And we deliver all of these services with the famous Everlast commitment to quality at affordable prices.